Five years ago, Lord & Miller created the nationwide phenomenon that had every child singing “Everything is AWESOME!! !” on a loop. Now all our favorite characters are back, but instead of facing Lord Business, Emmett and friends are now facing a post-apocalyptic world after the Duplo invasion. Like it’s predecessor, this feature length toy commercial is filled with social commentary and important lessons for both adults and child in our current politically charged community. 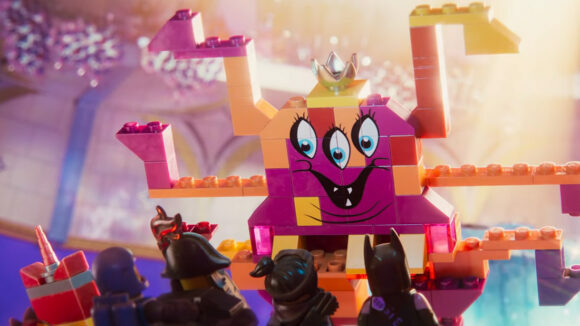 In a world of constant sequels and remakes, The Lego Movie 2 was facing a hard case of sequelitis, but this second installment is actually a surprisingly good contender in comparison to the original. I would argue that it’s a little bit more mature, as would make sense, since the original viewers have now aged up five years and that our world has changed since 2014. Paralleling the relationship between brother and sister, Finn and Bianca, in their separate worlds of Legos. Finns’ is more gritty and brooding, the result of Bianca’s Duplo invasion into his world five years prior. Thus, leaving anything awesome in the past and creating a conflict for happy-go-lucky Emmett, who is continuously told that he needs to grow up and toughen up by his friends and most importantly, Lucy, his love interest. Bianca’s world is all sparkles and pop songs, as well as absolutely adorable stars and hearts. Which would seem normal to any little girl, but to Finn and his Lego subjects, they view it as deadly. If exposed to any happiness and fun, they will immediately be brainwashed by Queen of the Sistar System, Queen Watevra Wa’Nabi, a shape-shifting being who sings about how she is not evil, despite seeming incredibly menacing. Which bring me to the music and songs, that I still cannot get out of my head. There’s a lot more this time around and they are equally as catchy as “Everything as AWESOME!! !” The sequel’s equivalent would be “Catchy Song,” a poppy song with the sole purpose of getting stuck in a listener’s head. Seriously, it’s lyrics are “this song’s gonna get stuck inside your head” on repeat forever. Even as I’m writing this article, I’ve been humming it under my breath like some cultist chant, but it’s a song that kids and families will love, for sure. Other than that, all the voice casting is pure perfection. Chris Pratt is always a win for me. His line delivery is always hilarious, as is nearly everyone else as their respective characters. My personal favorite would be Channing Tatum and Jonah Hill as Superman and Green Lantern. Tiffany Haddish, also makes a good Queen Watevra Wa’Nabi. My one tiny issue with her casting, is that she has such a personality in her voice, as it’s so recognizable that to me, that was Tiffany Haddish on screen and not Queen Watevra Wa’Nabi. Despite that, I personally think this is fantastic kids movies. Recently, I’ve noticed movies such as Zootopia and Smallfoot, relying heavily on deeper meanings and important sentiments for kids to grow up with. While some might be hitting the hammer on the head, others such as The Lego Movie 2, weave story and significance properly. I believe that had to do with the multiple themes within. Which teaching to work together, the film also taught that you don’t have to grow up too fast and that everything can’t be awesome all the time, but it can be if you try. Another song calls out the fact that having everything be awesome, all of the time is an unrealistic expectation. For some things I felt could have been better, I personally felt as if the beginning of the movie dragged a bit. I felt as if I was waiting for the movie to start, but was instead catching up on exposition and world building. Also, I wasn’t the biggest fan of Rex Dangervest and how much the movie was involved about him. I understand that he was the toxic and douche version of Emmett when he toughened himself, but I don’t think he had the be the ultimate villain. Speaking of villains, while Maya Rudolph was funny as the “Mom-ageddo,” I also felt as if her scene was dragged out and it was definitely for parents more than kids. Ultimately, I really enjoyed the film. I think its a great watch for both parents and children, or rather everyone really. I don’t have kids and I liked the movie a lot. It’s a nice break from the density of real life and a nice reminder on ideals that we might have forgotten while growing up. Not to mention, it’s really funny. Like any kids movie, there is always going to be subtle adult humor, but I found myself laughing at the jokes meant for kids too.